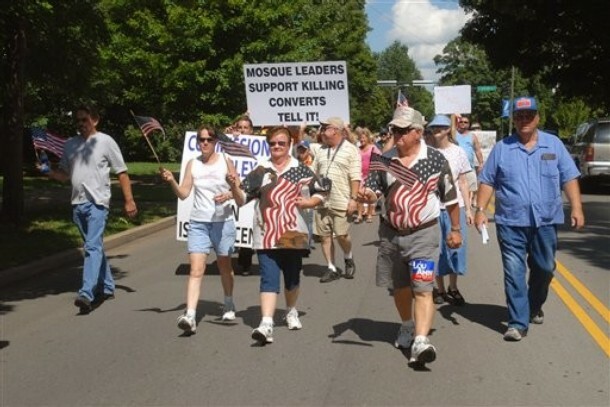 True American patriots march against religious freedom in Rutherford County, Tennessee. It took the Federal government almost 100 years after the Civil War to tell southern bigots that it wasn’t enough to just free the slaves, they had to also treat people of African descent as equals. The U.S. Department of Justice showed us today that they will not wait for southern white crackers to recognize that equality and religious freedom are rights that all residents of this country may enjoy. How’s this graffiti as an expression of good’ol southern hospitality? 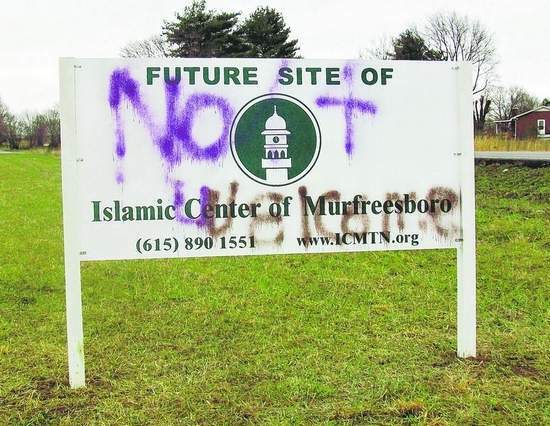 For more than 2 years, the locals in Rutherfod County have held rallies and marches against the construction of a house of worship intended to serve the local Muslim community. Why? You have to ask? Because as we all know, people who subscribe to the Islam faith are really all murdering terrorists out to destroy America and Christianity. 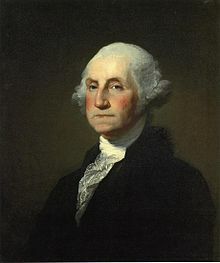 “The Citizens of the United States of America have a right to applaud themselves for having given to mankind examples of an enlarged and liberal policy: a policy worthy of imitation. 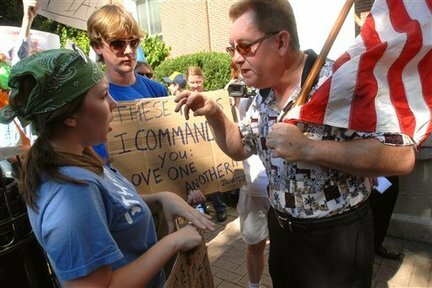 All possess alike liberty of conscience and immunities of citizenship. It is now no more that toleration is spoken of, as if it was by the indulgence of one class of people, that another enjoyed the exercise of their inherent national gifts.